For wet and slippery missions, there’s Cairn Pro. With its super sticky, non-marking Vibram Megagrip® outsole, our Pro model gives you superior footing no matter where you wander. Minimalist footbed conforms to your feet for superior ground feel, flexibility, and packability. 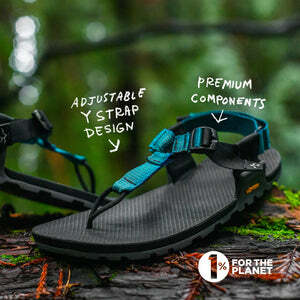 All Cairn Pro Sandals are made with 100% vegan materials and construction. NEW plug-less toe post and aluminum hardware for next-level durability. 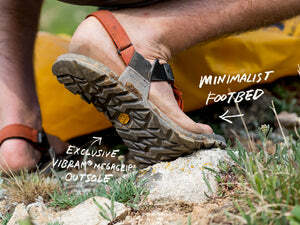 Ultra-grippy, exclusive REGOLITH Bedrock x Vibram® outsole made Megagrip. Aggressive, angular lugs massively increase performance and durability, while shedding mud and debris. We spent years sourcing the best materials, so you can spend maximum time enjoying the outdoors. With an exclusive Vibram® rubber outsole, polyester and nylon webbing upper, metal and acetal plastic hardware, and US military-grade Velcro®, you’ll do just that. Assembled in the USA with Domestic + Foreign Parts (soling imported). Perfect for down river paddle boarding! So far I am loving these sandals. I used to paddle board in Chacos but they’re so heavy and bulky. These are really lightweight, and the super sticky soles grab rocks when I have to jump off. I haven’t had to swim in them yet but I feel like it will be much easier than swimming in Chacos. Definitely recommend for water sports. They might not need yet another rave review, but I'm giving them one nonetheless. This is my third pair of cairns. I've been wearing them since they first came out, and every day since then. Living in Vermont, most people give you a weird look when they see you running in sandals in early march, but that hasn't phased me. My various pairs of sandals have traveled all over the US and Canada. They've been my constant companion when hiking, biking, climbing, kayaking, running, you name it. Furthermore, but they cured my feet and back problems. There's no finer footwear. The shoes fit just as the printed image said. They are comfy and lightweight. I am ready for warmer weather to wear them on the daily. Second pair, wore the first pair out over three years or so. Heavy daily use spring to fall. Great sandals. So impressed thus far. Only a week in, but have worn my Cairn Pros nonstop and comfort is king, as it should be. I usually have a break-in period for my feet getting used to sandal season but these have been super right out of the box. Adjustment is easy and I don’t even notice the cord between the toes — it is an ingeniously simplistic way to anchor the foot. I am excited and hopeful for my wife to try these as she has bunions and the strap system could be clutch.